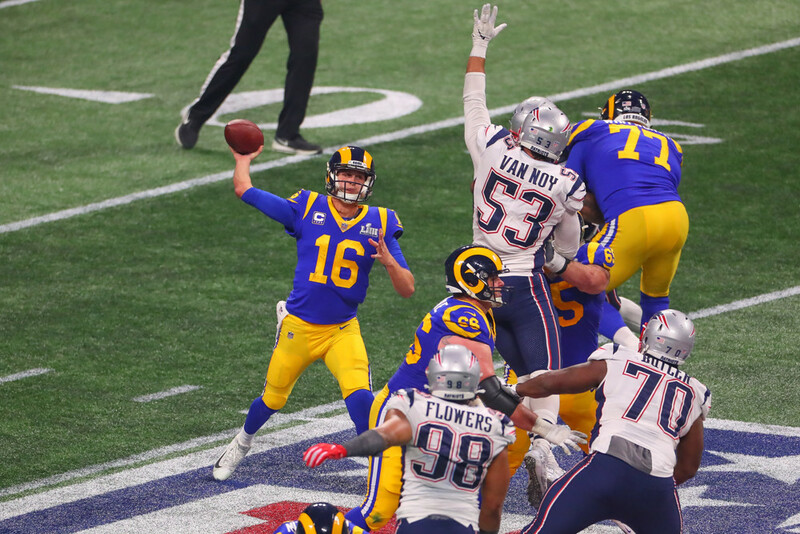 The Rams quest to give Los Angeles its first NFL championship since the 1983 season ended with them being held to a Super Bowl record-tying-low point total in a 13-3 loss to the New England Patriots on Sunday in Super Bowl LIII. Rookie Sony Michel ran two yards for the game’s lone touchdown with seven minutes to play in the lowest-scoring Super Bowl. The touchdown on the five-play, 69-yard drive came one play after Tom Brady’s 29-yard pass to Rob Gronkowski. “He just played the best game he has all year,” Brady said. “So proud of him (and) what he’s accomplished coming back from his ACL (injury). He just fought it out, grinded it out just like everyone else. “That punt probably rolled for half the total distance so I wasn’t too happy with the way that one came off my foot but to have that next to my name and to know that whenever I look at that opportunity I’ll think of the guys that work their tails off during the week, the other 10 guys that are on the field that have made that a possibility,” Hekker said. New England’s first-quarter possessions ended with an interception of a Brady pass by Rams linebacker and San Diego native Cory Littleton, a miss of a 46-yard field goal attempt by Gostkowski and a punt by Allen.